To enjoy your favourite wine, you need to use your best wine glasses, but making sure they stay in one piece, undamaged and in top condition can be quite a challenge, or is it? We’ve all been there, you’ve grabbed your favourite bottle of red, popped the cork from the bottle, go to get your glasses from the cupboard but you’ve accidently knocked your glasses over and they’ve smashed, everywhere! You’ve then got to clean up the broken glass (never easy), you’ve got no glasses to drink from and the moment’s gone, all you’ve got use is your tumblers, if you so dare! All is not lost though, here’s where Wineware come in! Forgot about storing your glasses in the cupboard where they’re at risk from being knocked, use a wine glass hanging rack or a glass storage box instead. These two simple solutions will help prevent you from spoiling the moment ever again, we can’t guarantee that you won’t ever break a glass again but we can certainly say it will reduce the risk! To prevent any future chipping, breakage or cracking, storing your glassware in the correct way is essential, they should be away from highly used areas and shouldn’t be touching each other (bowl or base). It’s recommended that glasses be stored upside down (bowl down / base up) as this helps keep dust and other debris from collecting within the bowl. 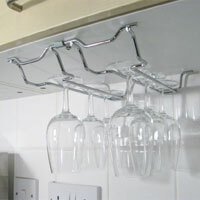 We believe that one of the best ways to store glassware is with a wine glass hanging rack. Glass storage racks are designed so the stem of the glass (any stemmed glassware) can be inserted between metal prongs so the bowl is facing downwards. 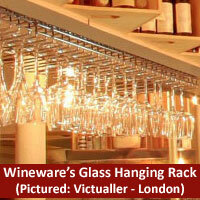 Different racks allow you store different glass capacities and they range in width, height and depth. They can be used in the kitchen or dining at home, alternatively they are popular with bars and restaurants that hold large quantities and lots of different glass types. If you don’t tend to use your glasses that often or would prefer to keep your glassware stored away, our glass storage boxes would be perfect! 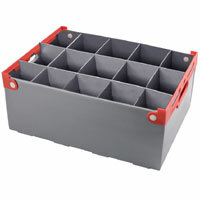 The boxes are designed with individual compartments within the box to store each glass; this prevents them from knocking into each other and breaking / chipping. Storing your glasses like this keeps them out of harm’s way; it’s also popular with people either moving home or those that transport glassware regularly in bulk for wine tastings. We believe that a glass storage box or our glass hanging racks are the best ways to store glassware, whether it’s your favourite wine glasses or elegant champagne glasses. 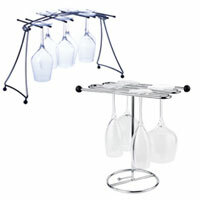 They both work equally well if it’s for use at home in the kitchen or if you have bar area in your restaurant. 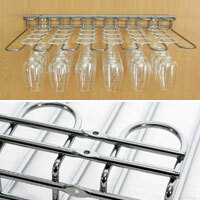 Click here for more information regarding Wineware’s range of wine glass storage solutions.